Study in Italy è una scuola di lingue boutique per amanti della Dolce Vita. Il nostro focus è la cultura italiana. Scegli tra le nostre sedi di Genova e Siena. Study in Italy punta ad offrire un’esperienza indimenticabile, che arricchisca l’individuo e il suo percorso formativo. I loved studying here this summer. The best part of the class was the staff because neither my academic nor my cultural experience would have been as wonderful or as deeply special if it hadn't been for the constant company, support, kindness, accessibility, and frienship of the teachers. This has been a life-changing experience for me. My favorite part was everything. The professors were outstanding and very helpful. I am very thankful for everyone’s help and time with teaching me the language and the culture. The trips were so much fun as well. It is nice to learn culture outside the classroom. Amazing professors. Great, relax environment that really helped my speaking ability improve. Study in Italy was fantastic. I loved all of the staff members; they were so fun, intelligent, and helpful. I loved that we got to have classes and go on excursions with the other students because we made such great friends. Thanks for everything! All was a beautiful crescendo even unto the last day. I could not have sanely asked for a more beautiful, valuable, and cherishable two months. I very much enjoyed this program. 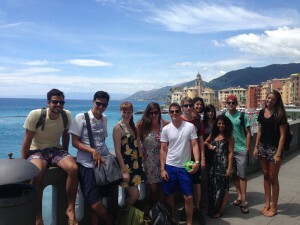 I think Genoa is also just a brilliant place to have it… I don’t wish for this experience to end yet. I’m so glad I got to meet people from different schools and speak the language I’ve been learning for years every day. I’m very thankful for their institution and for the instructors who are very well qualified and great. Thank you so much for the wonderful opportunities and experiences! I learned so much more than I thought I would in so little time! Thank you for all of your hard work and patience. It was a great class. I learned a lot, and I didn’t think I would learn Italian so quickly and easily! I’ve had an absolutely unforgettable experience here – one that will stay with me forever. The course and people well exceeded my expectations. The teachers are amazing people – they’re warm and caring; from the very first week here I felt welcomed and at home. I also don’t think I’ve ever enjoyed going to class so much before taking this course! I loved every minute of it… I will definitely miss Study in Italy and its staff. I really hope that I can return at some point in the future - either as part of a new course or just to visit everyone again. Language-wise, this course has given me everything I’d hoped it would. Culturally, it has surpassed any expectations I had ever remotely formed. Staff was indescribably wonderful! I was very pleased with my teachers. They were all very patient and were willing to continue explaining something until I understood. I felt very lucky to get private instruction! Staff was extremely helpful and welcoming. I felt like a guest, rather than a client! "All this time that I lived in Genoa, I fell in love with the city more and more. I loved the landscape, the port area, the piazzas… Genoa's natural beauty and city charm were priceless and I'm glad I got to experience it first-hand… I learned about mugugno, "bellin," and the Genoese sigh… Thank you to everyone in this city that has made my experience so wonderful that I do not want to leave. A great European experience. Close to all of Europe and a great location in Italy… A genuine Italian experience. A great city to really experience Italian culture without being too touristy. I really like being in a city where there were very few Americans… It was easier to integrate into the culture and meet Italians. The instructors showed great interest in each and every student, going above and beyond what I personally expected. So much was fantastic. The immersive nature of the school helped very much in learning.